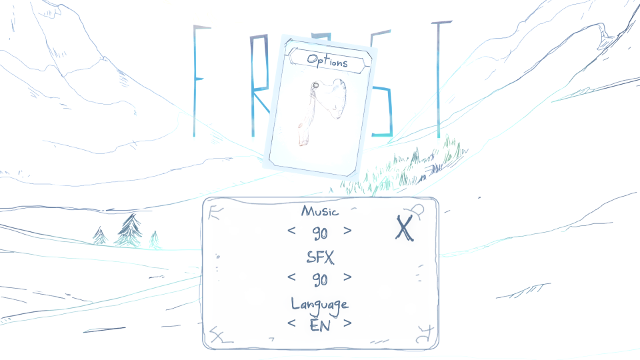 Frost‘s aesthetic is very, er, white. A game about cold and ice is predominantly white? Colour me shocked, I guess. Frost wastes little time setting the mood. 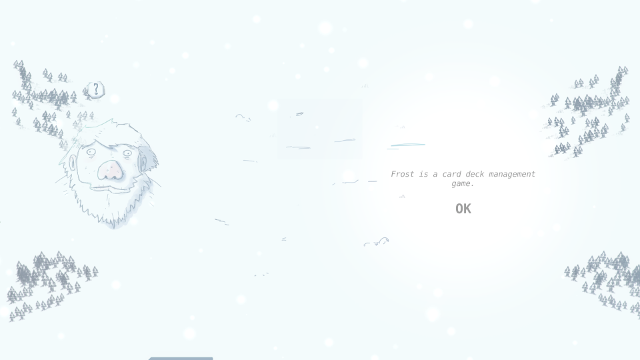 The title screen is the blinding white of a sun-covered snowfield. Snowflakes flurry past as visibility bobs up and down. And the background music track is the low droning howling of the wind, intercut every now and again with rhythmic deep breathing. Welcome to the arctic, player. Hope you brought your mittens. Resources are scarce in the frozen tundra. This is cleverly reflected in the game’s options, which are also scarce. And of the remaining four on-screen buttons, one exits the game. One (‘Scenarios’) is a slightly-greyer blue, indicating it’s disabled. And the final two both start the game… the difference is that one button overtly offers to teach me to play the game, while the other one mostly offers inept, frost-bitten death. So I guess I know which one I’m going for first. After a brief white-out, Frost fades back into existence. And then the learning start. First lesson: I will not, in fact, be getting any more colour. 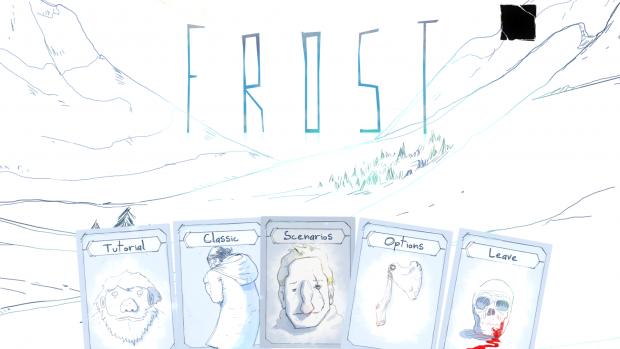 “Frost,” Frost tells me, “is a card deck management game.” Which I hope is just a needlessly different name for ‘deckbuilding game’. 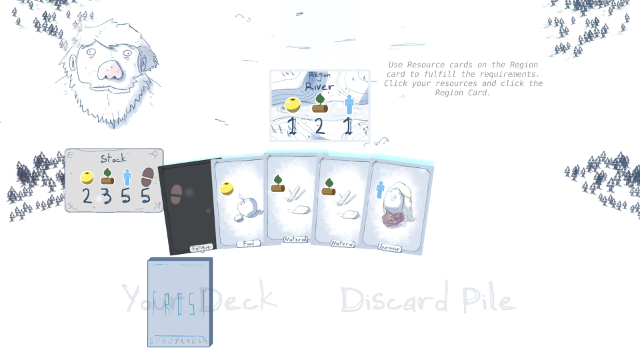 “You start with a limited set of Resource cards,” it says, and suddenly these cards bloom into existence! With lights, and shapes, and actual colours! Turns out my previous ‘first lesson’ was *dead wrong*. What am I looking at here? I have a handful of cards: one yellow ‘Food’, two green-brown ‘Materials’, one blue ‘Survivor’ with a fancy purple scarf, and one entirely black card with a brown footprint — ‘Fatigue’. On a limb, I want to guess that one’s ‘bad’. An overview to the left shows me my entire ‘stock’ of cards, using the same icons. 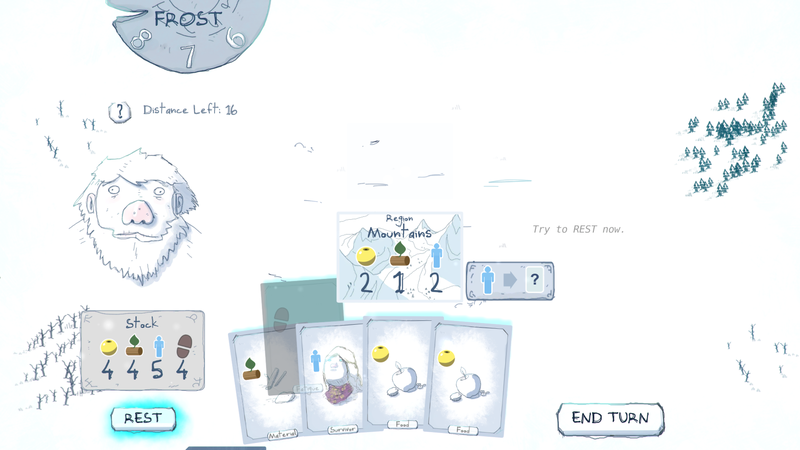 I’m not sure if this tallies the remaining cards in my deck? Or the total number of each card I have? Or something else entirely? I know I’m in the tutorial, but I’m still willing to chalk this up to coincidence. 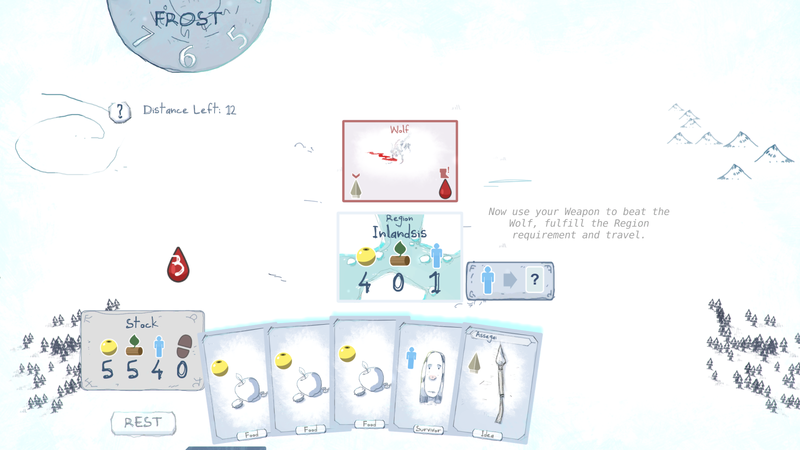 By click-and-dragging the cards from my hand to the Region card, I use these cards to fulfill the ‘travel requirements’. 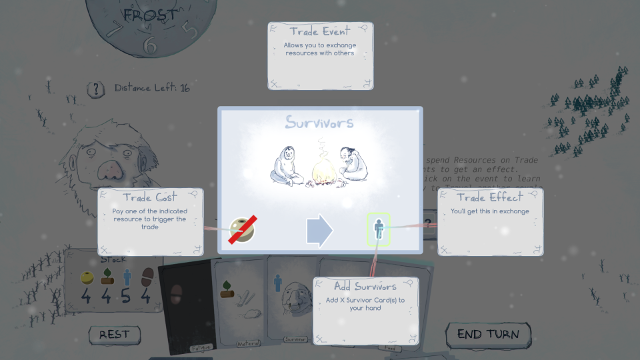 Get enough of every card — a bit of food, some materials, and one survivor — and I’m able to traverse the frozen river! I’m stomping *all over* the frozen river. Of course, things aren’t always that easy. Sometimes I won’t immediately have the right cards to move through a region. It’s possible to pay the cost in bits and pieces, but once there’s nothing else to do, I can ‘rest for the day’ to essentially end my turn. 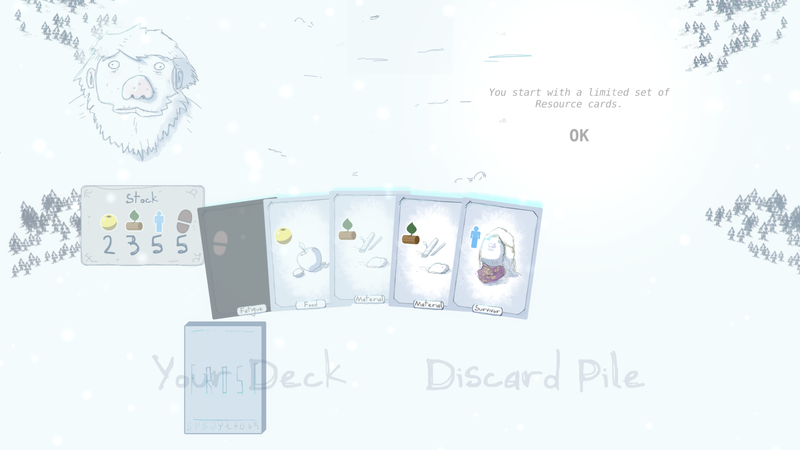 This discards the remaining cards and draws five new ones. But it also decrements the ‘Frost counter by one. The Frost Counter indicates how far away I am from a deadly oncoming blizzard. If the counter ever reaches zero… Ending a turn without traveling decrements the counter, but successfully traveling — which also ends the turns and refreshes my hand — increases it instead. 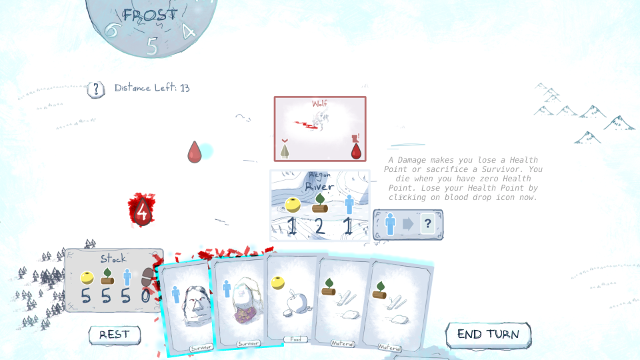 Of course, Frost would be a pretty boring game if all it did was ‘match the card symbols to the Region symbols, and hope you get the right cards before the death counter gets you’. 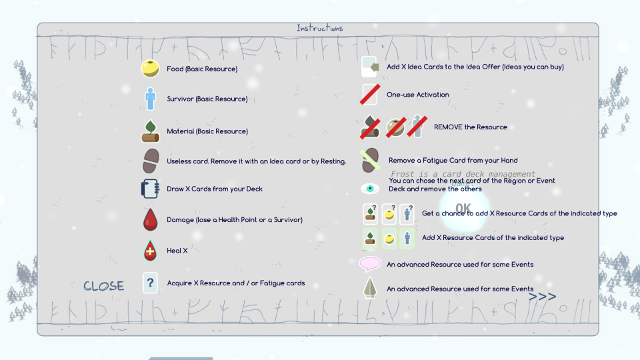 For instance, the blue Survivor cards pull double duty: they can be used to travel, but they can also be used to ‘scavenge’. 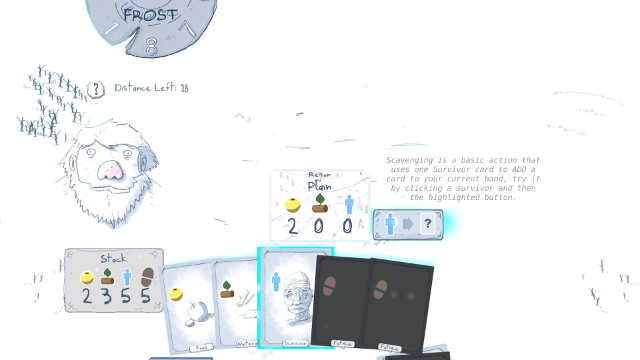 Here, I discard one Survivor card, and in return, I get… one other card. In this image, I have one of each card. Not enough to travel the plains. This is bad! But then I send my Survivor scavenging. And lo and behold! I suddenly have one extra food. I’m actually not entirely sure where this new Food card just came from. Did I draw it from my deck? I don’t think so. When I look over to the ‘stock’ screen on the left, I see that my store of Food cards has permanently increased from 2 to 3. I guess my scavenger just… willed that Food into existence, somehow? And now it’s mine forever? On the tutorial’s advice, I ‘travel through a couple of Regions’. I pay some attention to the scavenging mechanic, and sure enough, it really looks like this adds actual new cards to your hand and deck. Food, Materials, other Survivors. Or sometimes, the useless black Fatigue cards. These cards don’t do anything but make me mad that I drew them… but I guess the ‘useless card that you wish you hadn’t drawn’ is a deckbuilding staple. There’s usually an option to get rid of cards like these, too. And, sure enough, Frost introduces me to ‘resting’. By clicking the Rest button, I skip my current turn and decrease the Frost counter without doing anything — not a single card play is allowed. But in return, every single Fatigue card in my hand is destroyed permanently, never again to plague my future hands. ‘Event’ cards are thrown into the mix next. Every region has one of these. Sometimes, they’re useful. For instance, there is a Campsite in the cliff region where I can have my Survivors scavenge specifically for Material cards, with no risk of downside. And in the mountains, I find a Survivors event: here I can permanently destroy some of my food cards to get an equal number of survivor cards added to my deck in exchange. I don’t know why I’d want these grumpy sourpusses in my team, but desperate times, I guess. Other times, the events are harmful. In the wet tundra, I encounter a dangerous wolf! Helpfully outlined in red. I need to pay one ‘weapon’ point to defeat the wolf, a resource I don’t actually have. Otherwise, when I travel, the wolf deals one damage to my party. Which means either I lose one of my four precious hit points — lose all four and it’s game over — or I have it kill one of my Survivors instead. Hmm… pain for *me*, or pain for the nameless, voiceless survivor cards that I have more than enough of anyway? But how do I get access to weapons? 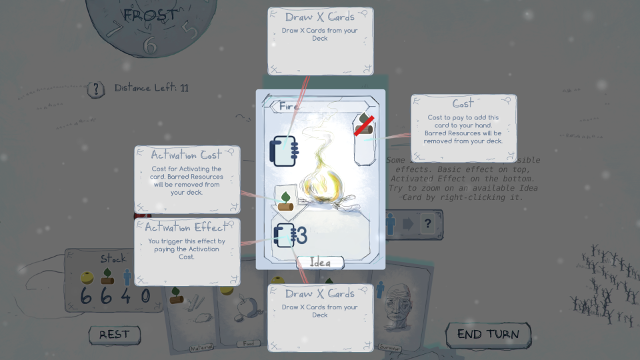 That’s the role of the last mechanic, the most deckbuilding-y of this deckbuilding game: Idea Cards. These appear on the top of the screen as I travel. They represent neat, useful upgrades — like an ‘assegai’ spear, perfect for hunting wolves! I can buy this card for the associated cost, at which point — very much in a deckbuilding tradition breaker — it goes to my hand directly, ready for use. And then it becomes a rotating part of my deck after that. Prepare to have a bad day, wolf. 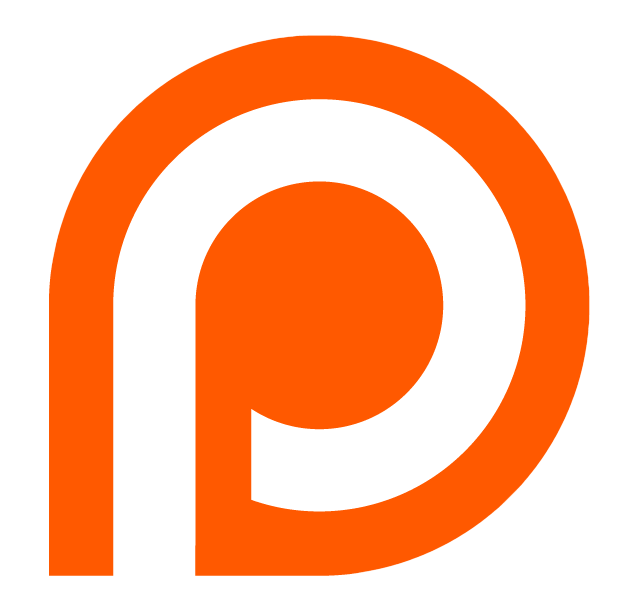 Ideas can get pretty fancy. Like fire. Check out this fancy fire! 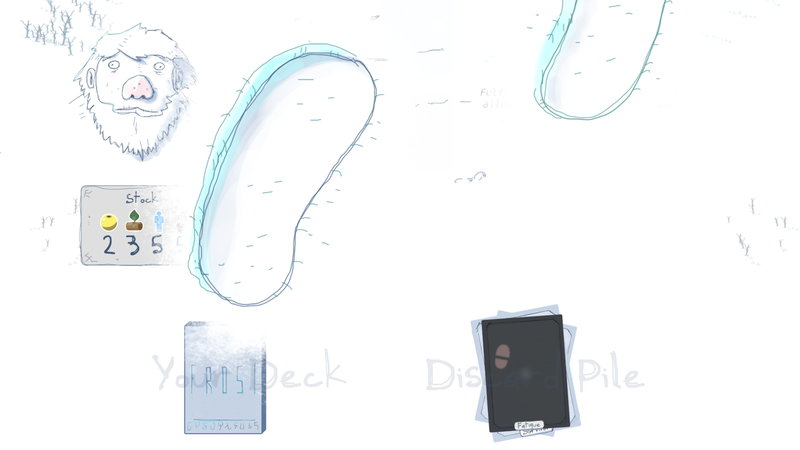 Either play the card to draw a card, or play the card plus one Material to draw *three* cards. And… that’s it, I guess! Those are all the instructions I need to play Frost. The tutorial suggests that I can either quit, check the ‘advanced instructions’ in the mid-game menu screen, or try to complete this tutorial game. Of course I attempt to complete the game. The tutorial started at a ‘distance’ of 18, meaning I would need to travel 18 times to clear it. But at the point the scripted events end, the travel counter is down to 11. And the Frost is six turns behind me. Surely I can manage to make 11 travel steps in 16 turns or less? Without getting eaten by wolves? It turns out that I totally can! For my success, I am granted new cards. 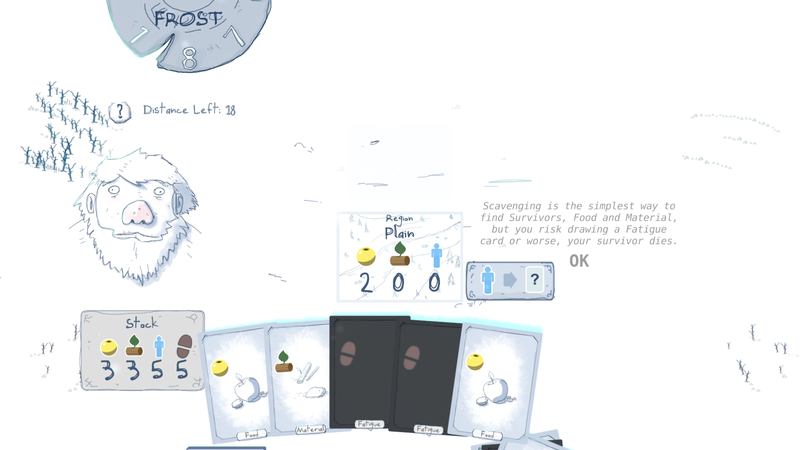 Turns out that the cards I’ve seen in this game are not the complete possible set. Rather, I’ll gain new Idea and Event cards from… from ‘playing’, I guess. I’m not sure what the unlock criteria are. I’m not even sure why I got these three cards this time around. Is this just the reward for my first victory? Is it random? Is there a list somewhere? Regardless. 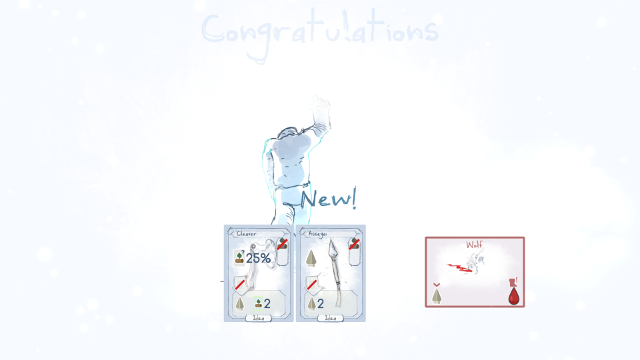 I’ve beaten Frost on Easy difficulty, if my Steam achievement is to be believed. Time to play some more. The Scenario card still hasn’t unlocked, so I guess I’m out of luck on that one. But I can play a classic game, on either Eay or Medium difficulties. So let’s do that and see where I end up! Can I survive Medium difficulty? Turn the page and find out, woo!